With the growing presence and sophistication of online threats like viruses, ransomware, and phishing scams, it’s increasingly important to have the right protection and tools to help protect your devices, personal information, and files from being compromised. Microsoft already provides robust security for Office services, including link checking and attachment scanning for known viruses and phishing threats, encryption in transit and at rest, as well as powerful antivirus protection with Windows Defender. Today, we’re announcing new advanced protection capabilities coming to Office 365 Home and Office 365 Personal subscribers to help further protect individuals and families from online threats. With an Office 365 Home or Office 365 Personal subscription, you already get best-in-class apps like Word, PowerPoint, and Excel as well as powerful cloud services like OneDrive and Outlook.com. 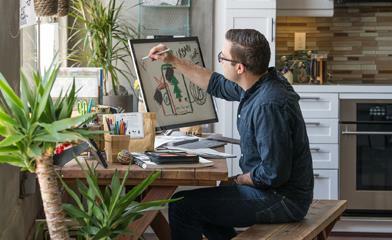 Office 365 lets you create, share, and communicate anywhere, on any device. File recovery from malicious attacks like ransomware. Tools to help keep your information secure and private. Advanced protection from viruses and cybercrime. Ransomware has become an increasingly pervasive attack method in which cybercriminals “lock up” and prevent access to files in an effort to extort money from their victims. To help protect customers we are introducing two new capabilities that allow you to recover your files if they are affected by a malicious attack like ransomware. Files Restore—We’re bringing our powerful Files Restore feature from OneDrive for Business to your personal OneDrive account, so it doesn’t matter if they’re work or personal files—they’re protected in OneDrive. 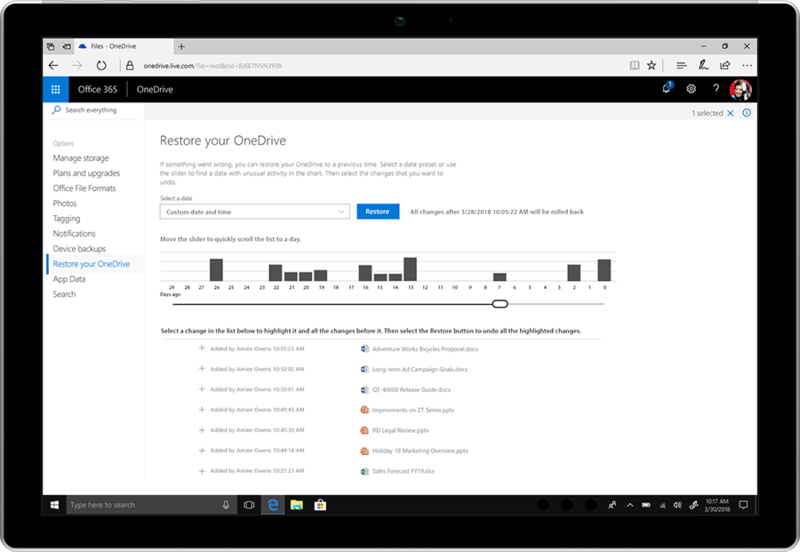 Files Restore allows you to restore your entire OneDrive to a previous point in time within the last 30 days. You can use this feature to recover from an accidental mass delete, file corruption, ransomware, or another catastrophic event. With Files Restore, you can recover from an accidental mass delete, file corruption, ransomware, or another catastrophic event. 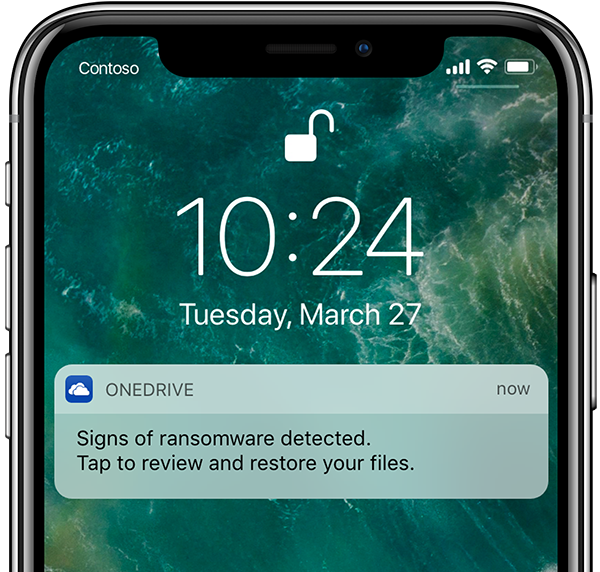 Ransomware detection & recovery—Office 365 can now detect ransomware attacks and help you restore your OneDrive to a point before files were compromised, so you don’t have to submit to cybercriminal demands. We know this is important to our customers and a top request on UserVoice. If an attack is detected, you will be alerted through an email, mobile, or desktop notification and guided through a recovery process where you’ll find the date and time of attack preselected in Files Restore, making the process simple and easy to use. As these threats evolve, we are continuously improving detection capabilities to help keep you safe from the most advanced ransomware. Notification of ransomware detected on your mobile phone, so you can immediately take action and restore your files. Sending confidential or personal information online, like tax documents, family budgets, or a new business proposal, can be worrisome. Whether you’re sending an email or sharing a link, you want your information to reach only the intended recipients. Office 365 is adding three new capabilities to help keep your data secure and private in these cases. Password protected sharing links—We’re adding an additional security option for links you share in OneDrive. You will now be able to set and require a password to access a shared file or folder. This prevents others from accessing your files if your intended recipient accidentally forwards or shares the link. Set a password to access shared files or folders for an additional layer of protection. Email encryption—Email encryption in Outlook.com offers an added layer of protection and ensures end-to-end encryption of your email. Unlike Outlook.com, some email providers don’t encrypt their connection, making it easy for hackers to intercept and read your communication. When you use Outlook.com email encryption, your email remains encrypted over a secure connection—minimizing the threat of your information being intercepted or leaked to cybercriminals. Encryption is particularly useful in cases where it is unclear what level of security your intended recipients’ email providers offer. Recipients receive a link to a trusted Office 365 webpage where they can choose to receive a one-time passcode or re-authenticate with a trusted provider before viewing the email. Outlook.com email recipients who view the encrypted email in Outlook.com, the Outlook for iOS and Android app, or the Windows Mail app can read and reply just like they can with any other email—no extra steps needed. When composing an email in Outlook.com, sensitive information like social security numbers can be detected to provide you with a suggestion to send with encryption. Prevent forwarding—You can now restrict your email recipients from forwarding or copying emails you send from Outlook.com. Additionally, Microsoft Office documents you attach to these emails are encrypted even after downloading, so if the recipient shares or forwards your attachment, the recipient of the forwarded email will not be able to open the attachment. Emails sent with the prevent forwarding option are also encrypted. Select Encrypt and Prevent Forwarding so recipients can’t forward or copy the email. In October, we announced advanced link checking and attachment scanning in Outlook.com to protect you from previously unseen viruses and phishing scams in real-time. As cybercriminals resort to tricking people into giving away their sign-in credentials or downloading viruses through malicious emails and links, these advanced protections help keep Office 365 Home and Office 365 Personal subscribers safe with enterprise-grade security. Advanced link checking in Word, Excel, and PowerPoint—We know it’s also important to provide this advanced protection in other places you encounter links. Starting later this year, links you click in Word, Excel, and PowerPoint will also be checked in real-time to determine if the destination website is likely to download malware onto your computer or if it’s related to a phishing scam. If the link is suspicious, you will be redirected to a warning screen recommending you don’t access the site. If you click an unsafe link, you’ll see a warning screen recommending not to continue. Today’s announcements have focused on new, advanced protection capabilities for our Office 365 Home and Office 365 Personal subscribers. However, those who use our free services also have strong protections in place. This includes robust Microsoft account security like two-factor authentication and anomalous sign-in detection. In addition, all Outlook.com attachments and links in emails are scanned for known viruses and phishing threats. OneDrive scans files on download for known threats, provides file versioning for all file types, and sends notifications if a mass file deletion is detected. We also implement industry standards with encryption at rest and in transit. These core capabilities align with the Microsoft promise to offer a high degree of security and protection for all our users. We’re excited to provide these new advanced protection capabilities to our subscribers. Ransomware detection & recovery and Files Restore start rolling out today and will be available to all Office 365 subscribers soon. Password protected sharing links, email encryption, and prevent forwarding will start rolling out in the coming weeks. Advanced link checking and advanced attachment scanning is already available in Outlook.com, and advanced link checking in Word, Excel, and PowerPoint will be coming the second half of 2018. Visit our support page to learn more about all the advanced protection features included in Office 365 Home and Office 365 Personal subscriptions. Let us know what you think of our new features. Share your thoughts and ideas in the OneDrive UserVoice, Outlook UserVoice, Word UserVoice, Excel UserVoice, and PowerPoint UserVoice.